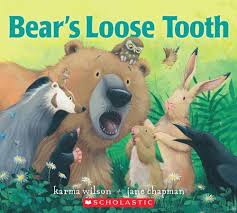 Tiny Tips for Library Fun: Now That's Toothsome! 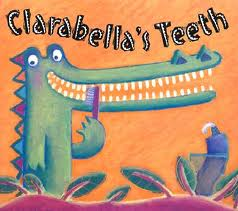 One of my favorite stand-alone programs for kids involves dental health and teeth. Since Dental Health Month is around the corner, I thought I 'd share. I use a crocodile puppet and a little bird finger puppet and tell the first half of the story where Bill gets a bird, Pete, as his toothbrush (and friend). They both go to school and Bill learns to spell his name with Pete's help. 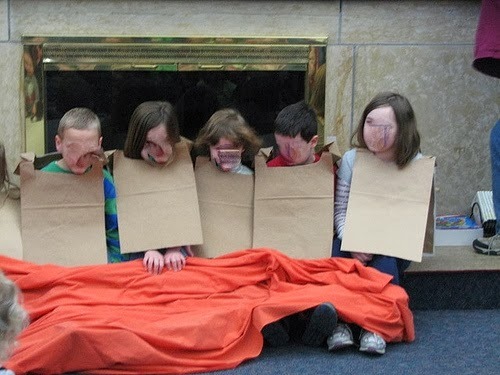 Cut the sides out of brown paper grocery bags and a scooped hole in the top for kids heads to go through. Tape white paper on one side. You now have a clean tooth and a dirty tooth! Ask for some of the kids to be your helpers. Have them sit side by side and cover their legs with a pink sheet or large cloth (they are now teeth with a gum around them!). 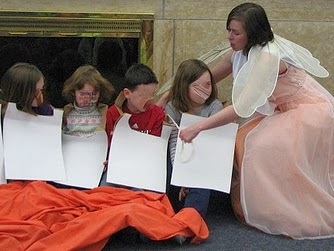 Slip the "tooth" bag over their head with the brown side in front. Use a large toothbrush (borrowed from a dentist or your health department) to brush the teeth and a piece of rope to floss them and talk about how much fun brushing teeth is. Then turn the bags around to the white side! This giant demonstration never fails to please. And if you are lucky, a tooth fairy may appear to help get those teeth brushed and flossed.